Mr Kays aged 103, travelled to Armagh to research his ancestors who had emigrated to America in the late 1840s during the Famine. His ancestor was a James Clemens McCourt (born in 1812) who emigrated with his wife Sarah Robertson and several children (James and his son also called James fought in the American Civil War). James Clemens McCourt was the son of Thomas McCourt and Eliza Maguire and Mr Kays believed that the family were Protestant, possibly Presbyterian. When Armagh Ancestry Genealogist Feargal O’Donnell conducted research into Mr Kays’ family he located the baptism records for Thomas Clemens McCourt and three brothers in Armagh parish Roman Catholic Church. Feargal explained that it was very likely that James Clemens McCourt’s wife belonged to one of the Protestant religions and that upon marriage he possibly converted to his wife’s religion and therefore this is why the family was Protestant in America. Mr Kays was very emotional at being presented with a copy of his great grandfather’s actual baptism record and said that it gave him a sense of belonging to County Armagh. Mr Kays, his daughter Jolie and her husband continued their journey leaving for Scotland where they were going to visit the port where his ship landed in 1944 and they were going to retrace the journey he made through England and across to France to St Malo. 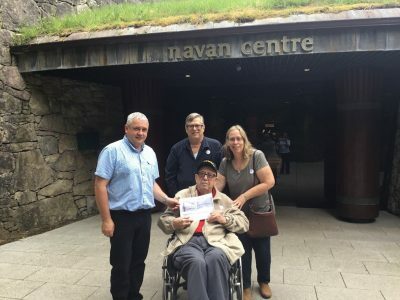 Feargal O’Donnell (Genealogist, Armagh Ancestry) presenting Mr George Fred Kays (Purple Heart awardee, who was a member of the 243rd Field Artillery Battalion, US 3rd Army and he fought in St Malo at the Citadel, during the Battle of Brest in France) with a copy of his ancestor’s baptism. Also included are his daughter Jolie and her husband.